Following his recent week-long trip to several of the Caribbean islands including Cuba, Jamaica and Trinidad and Tobago, ETurboNews (ETN) has reported that Tanzania’s President Jakaya Kikwete believes that the Tanzania tourism industry can learn a lot from the Caribbean beach tourism. According to President Kikwete, the development of Caribbean tourism locations offers numerous interesting and important lessons for Tanzania beach tourism as far as performance, infrastructure and the provision of services to tourists is concerned. “I was very impressed by tourism in Trinidad and Tobago, Cuba and Jamaica,” he said in the ETN report. In addition the ETN report also indicated that President Kikwete has expressed the need for increased investment in the sector in order for his country to better exploit the opportunities that are available in its own unexplored beaches, which span nearly 1,000 kilometers from north to south. During his Caribbean trip, President Kikwete not only toured the three islands, but also attended the Commonwealth Heads of Government Meeting. After returning to Tanzania, the President spoke with reporters in Dar es Salaam where, according to ETN, he said that in spite of the country’s impressive coastline, which extends from Tanga on the Kenyan border to the Msimbati area near the Mozambican border, Tanzania still lacks feasible investments that will attract tourists and allow them to take advantage of the country’s offerings. According to the ETN report, President Kikwete went on to say that, unlike the Caribbean islands of Cuba and Jamaica, Tanzania has not yet been able to effectively promote investment in the profitable beach tourism sector. The President went on to indicate that, based on the fact that wildlife-based tourist areas had attracted more than 95 percent of the country’s 950,000 tourists, the exploration of the beach tourism sector was extremely important to his country. 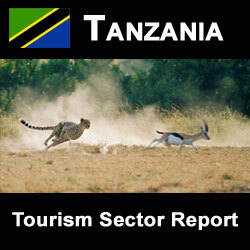 Compared to Jamaica, which has a population of 2.8 million and receives approximately 2.6 million annual tourists, Tanzania, which has a population of 36 million people, is currently focused on attempting to record one million tourists next year. President Kikwete went on to explain that because the majority of tourists are interested in beach tourism and sunbathing, these Indian Ocean beaches have the potential of attracting numerous foreign visitors. In order to accomplish this, the President said that the country would need to build exciting hotels along the beaches. In addition, the President also indicated that, through the implementation of these and other strategic changes, beach tourism could eventually take in more revenue than the country’s traditional leader in the tourism sector, wildlife tourism.